The prefix Qahtan was inspired by my Grandparent's Arabian horse stud name, and is owned by my mother. Qahtan cavies is a small stud, and only concentrates on the pretty Self Slate, hoping to get very far in the future. My mother has received some lovely comments on the Slates she has bred, as well as a Best Baby and Best Intermediate with a Self Slate boar she purchased from Sharon Deas (Deas Stud, Western Australia). 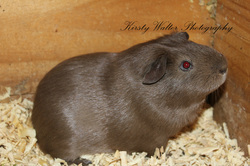 She has purchased a gorgeous Self Slate boar from the National Cavy Show in 2012, from Shuri Stud in Victoria. He will help produce some lovely show stock for mum in the future.